Is it true Autistics do not understand sarcasm? I think, like many things written about autism, this is a superficial view of a complex issue. It is true that I often miss it when someone makes a sarcastic remark to me. I find this curious because I am actually very sarcastic myself. And I've noticed a lot of other autistics are as well. So it's not true that we don't understand sarcasm. We understand it and use it ourselves. But for some reason we tend to miss it when others are being sarcastic. Is this due to others doing sarcasm wrong? Or could it be related to the inability to read social cues, the change in tone and inflection that signal sarcasm? I don't know what the answer is, but I would like to see people stop saying we don't understand sarcasm because it simply is't true. 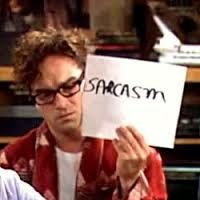 We may be less likely to detect sarcasm, but that isn't the same as not understanding it.